← What to eat? Low fat foods, high fat foods…..? “I couldn’t believe it, I could not think of any positive thoughts while looking down? 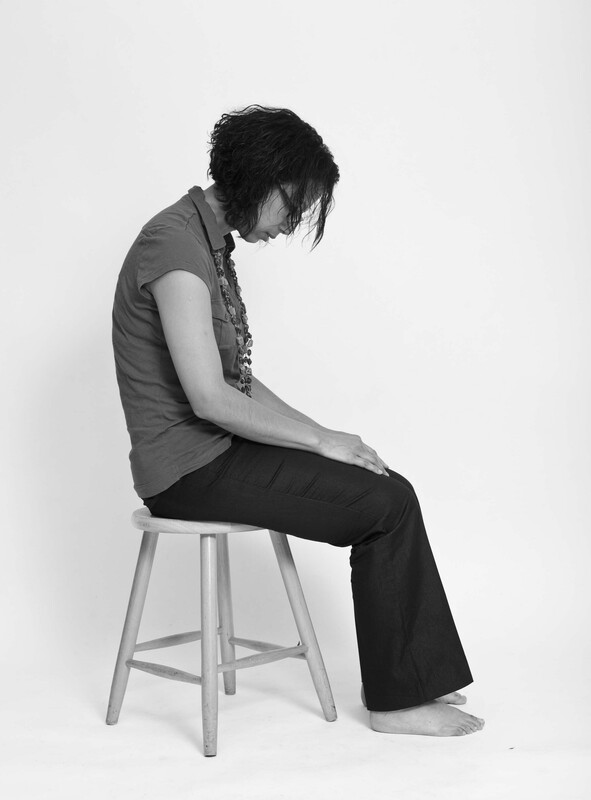 Body posture is part of our nonverbal communication; it sometimes projects how we feel. We may collapse when we receive bad news or jump up with joy when we achieve our goal. More and more we sit collapsed for many hours with our spine in flexion. We crane our heads forward to read text messages, a tablet, a computer screen or watch TV. Our bodies collapse when we think hopeless, helpless, powerless thoughts, or when we are exhausted. We tend to slouch and feel “down” when depressed. We often shrink and collapse to protect ourselves from danger when we are threatened. In prehistoric times this reaction would protect us from predators as we were still prey. Now we may still give the same reaction we worry or respond to demands from our boss. At those moments, we may blank out and have difficulty to think and plan for future events. When the body reacts defensively, the whole body-mind is concerned with immediate survival. Rational and abstract thinking is reduced as we attempt to escape. When standing tall we occupy more space and tend to project power and authority to others and to ourselves. When we feel happy, we walk erect with a bounce in our step. Emotions and thoughts affect our posture and energy levels; conversely, posture and energy affect our emotions and thoughts. At San Francisco State University, we have researched how posture changes physical strength and access to past memories. Experience this in the following practice (you will need a partner to do this). 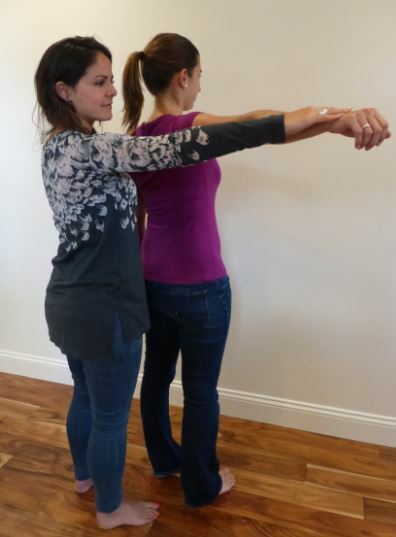 Stand behind your partner and ask them to lift their right arm straight out as shown in figure 1. Apply gentle pressure downward at the right wrist while your partner attempts to resist the downward pressure. Apply enough pressure downward so that the right arm begins to go down. Relax and repeat the same exercise with the left arm. Then relax. For the rest of this exercise, do the testing with the arm that most resisted to the downward pressure. Have the person stand in a slouched position and then lift the same arm straight out. Again the experimenter applies enough pressure downward so that the arm begins to go down. Relax. Then have the person stand a tall position and lift the arm straight out. Again, the experimenter now applies enough pressure downward so that the arm begins to go down. Relax. Describe to each other how easy it was to resist the downward pressure and how much effort it took to press the arm down while standing tall or slouched. In our just completed study in the Netherlands with my colleague Annette Booiman, we observed that 98% of the participants felt significantly stronger to resist the downward pressure when they stood in a tall position than when they stood in the collapsed position as shown in Figure 2. Figure 2. 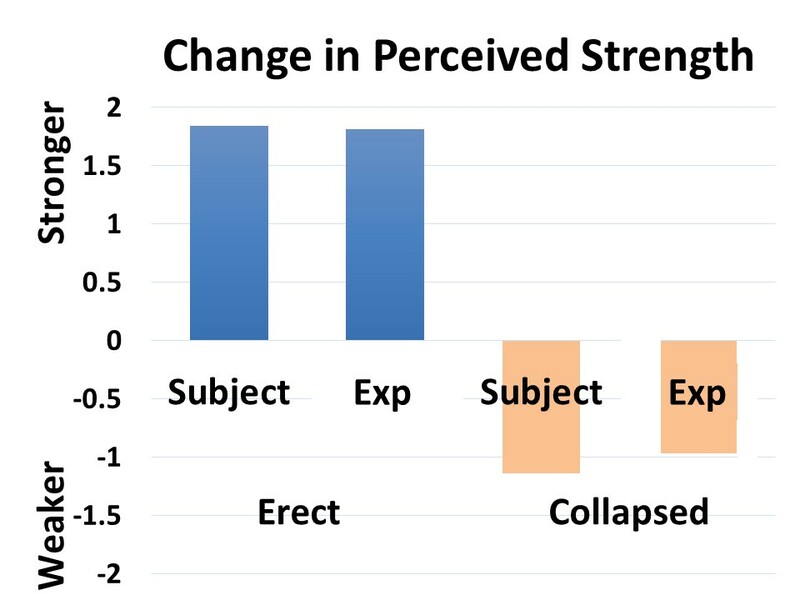 The perceived strength to resist the down pressure on the arm in either the erect or collapsed position as observed by the subjects and the experimenters (Exp). The subjective experience of strength may be a metaphor of how posture affects our thoughts, emotions, hormones and immune system. When slouching we experience less strength to resist and it is much more challenging to project authority, think creatively and successfully solve problem. Obviously, the loss of strength mainly related to the change in the shoulder mechanics; however, the collapsed body position contributes to feeling hopeless, helpless, and powerless. With my colleague Dr. Vietta Wilson (Wilson & Peper, 2004), we discovered that in the collapsed position it was very difficult to evoke positive and empowering memories as compared to the upright position (for more information see the article by Wilson and Peper: http://biofeedbackhealth.files.wordpress.com/2013/01/the-effects-of-posture-on-mood.pdf). Consistently, my students at San Francisco State University have reported that when they blank out on exams or class presentations, if they stop for a moment, change their posture and breathe, they can think again. Similarly, clients who are captured by worry and discomfort, when they shift position and look up, find it is easier to think of new options. Explore for this yourself. Sit comfortably at the edge of a chair and then collapse downward so that your back is rounded like the letter C. Let your head tilt forward and look at the floor between your thighs as shown in figure 3. Figure 3. Sitting in a collapsed position (photo by Jana Asenbrennerova). Reprinted by permission from Gorter and Peper (2011). While in this position, bring to mind hopeless, helpless, powerless, and depressive memories one after the other for thirty seconds. Then, let go of those thoughts and images and, without changing your position and still looking downward, recall empowering, positive, and happy memories one after the other for thirty seconds. 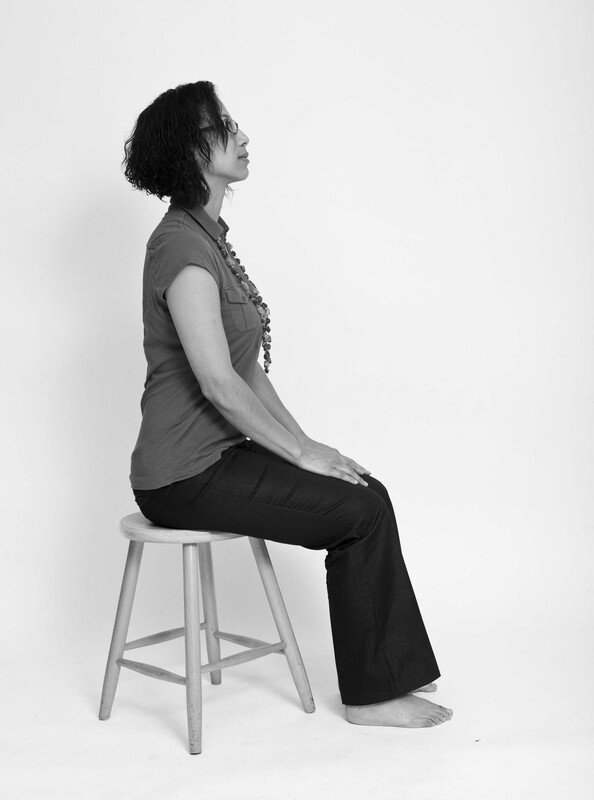 Shift position and sit up erect, with your back almost slightly arched and your head held tall while looking slightly upward as shown in figure 4. Figure 4. Sitting in an upright position (photo by Jana Asenbrennerova). Reprinted by permission from Gorter and Peper (2011). While is this position, bring to mind many hopeless, helpless, powerless, or depressive memories one after the other for thirty seconds. Ask yourself: In which position was it easier to evoke negative memories and in which position was it easier to evoke empowering, positive, and happy memories? Take charge, lightening your mood and give yourself the opportunity to be empowered and hopeful. When feeling down, acknowledge the feeling and say, “At this moment, I feel overwhelmed, and I’m not sure what to do” or whatever phrase fits the felt emotions. When your energy is low, again acknowledge this to yourself: “At this moment I feel exhausted,” or “At this moment, I feel tired,” or whatever phrase fits the feeling. As you acknowledge it, be sure to state “at this moment.” The phrase “at this moment” is correct and accurate. It implies what is occurring without a self-suggestion that the feeling will continue, which helps to avoid the idea that this was, is, and will always be. The reality is that whatever we are experiencing is always limited to this moment, as no one knows what will occur in the future. This leaves the future open to improvement. Remind yourself that you to shift your mood by changing your posture. When you’re outside, focus on the clouds moving across the sky, the flight of birds, or leaves on the trees. In your home, you can focus on inspiring art on the wall or photos of family members you love and who love you. When you hang pictures, hang them higher than you normally would so that you must look up. You can also put pictures above your desk to remind yourself to look up and to evoke positive memories. These two studies point out that psychology needs to incorporate body posture and movement as part of the therapeutic and teaching process. Without teaching how to change body posture only one half of the mind-body equation that underlies health and illness is impacted. Each time you collapse or have negative thoughts, change your position and sit up and look up. Arrange your world so that you are erect (e.g., stand while working at the computer, use a separate keyboard with your laptop so that the top of the screen is at eye level, or place a pillow in your lower back when sitting). Finally, every so often, get up and move while alternately reach up with your arms into the sky as if picking fruits which you can not quite reach. After having done these two practices, I realized how powerful my body effects my mood and energy level. Now each time I am aware that I collapse, I take a breath, shift my position, look up, and often stand up and stretch. To my surprise, I have so much more energy and my negative depressive mood has lifted. Gorter, R. & Peper, E. (2011). Fighting cancer-A nontoxic approach to treatment. Berkeley: North Atlantic Books. Wilson, V.E. and Peper, E. (2004). The Effects of upright and slumped postures on the generation of positive and negative thoughts. Applied Psychophysiology and Biofeedback.29 (3), 189-195. In an elegant study by Professor Amy Cuddy from the Harvard Business School, she demonstrated that two minutes of standing in a power position significant increased testosterone and decreased cortisol while standing in the collapsed position significantly decreased testosterone and increased cortisol. By changing posture, you not only present yourself differently to the world around you, you actually change your hormones (For more information, see Professor Amy Cuddy’s Ted talk: http://www.ted.com/talks/amy_cuddy_your_body_language_shapes_who_you_are). I would like to thank you, dr. Peper, for examining posture and it’s relation to strength, confidence, and memory! We can help students get better grades, or maybe even help many overcome hurdles they are jumping through because of their emotions! Also, who would not want increased memory? I personally experienced what you mention, and would like to share your work! Thank you! !